Former Washington Redskins tight end Fred Davis, wanted since last month for a domestic violence simple assault that allegedly occurred last month in Adams Morgan, pleaded not guilty in court Thursday. Davis turned himself in to D.C. police Thursday afternoon and could face up to a year in prison if he's convicted on assault and attempted threats. According to a police report, the incident took place about 3 a.m. June 2 at The Diner, a 24-hour restaurant in the 2400 block of 18th Street NW. Davis confronted his ex-girlfriend shortly after she arrived at the restaurant with a male acquaintance, according to the incident report. He approached from behind, put his hands on her shoulders and spun her around to face him, then asked the other man why he was with her. 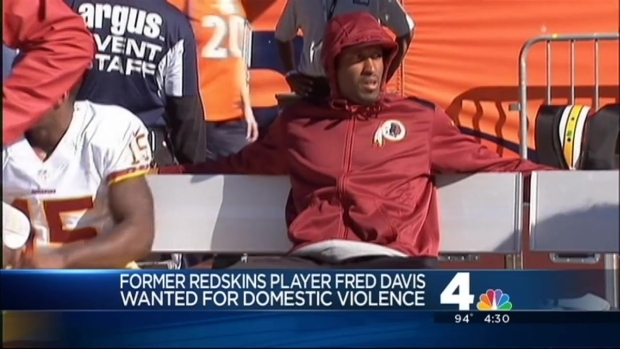 D.C. police are looking for former Redskins tight end in a domestic assault investigation. The woman excused herself to have a cigarette, and Davis followed her outside and “grabbed a handful of dirt and flowers from the hanging plant box and threw them at her," according to the report. She then went inside to get a ketchup bottle to squirt on Davis, but someone stopped her. The argument carried on outside for sometime during which Davis allegedly said to the woman, "I'm gonna slap you cause you fakin. Your friend looks like 2 Chainz." The victim, 28, told police that she was unharmed and did not call police until the following afternoon because she wanted to make sure she had her facts straight. Davis, who lives in Leesburg, was suspended indefinitely by the NFL in February for violating the league's substance abuse policy. The following day, he was arrested for driving under the influence in Fairfax County. He's due back in court Aug. 28. The 28-year-old appeared in 72 games for Washington between 2008-13, catching 162 passes for 2,043 yards and 13 touchdowns.